i know...from michael mina to bowling alley food. lol you may have no interest in reading this, which i can understand...there is no comparison. but i want to make note of the food and the guys who cook it. i have true appreciation for the cooks in the kitchen here at irvine lanes. why would i want to make note of bowling alley food? 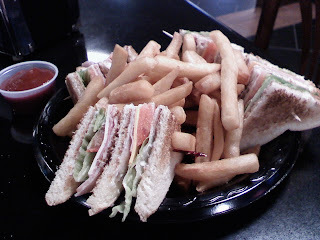 well, you can see how nicely my club sandwich is made. each layer so neatly stacked, perfectly toasted bread and nice clean cuts making four perfect triangles. i asked for my fries to be extra crispy and that's exactly what they did for me. yes, it needed a bit of seasoning...and i don't think the ketchup is heinz...but that's ok.
i love that they care about what they do...and how they present it. my ham was folded nicely on my bread, which is huge for me...two types of cheese...yellow american and white american or it could be processed swiss. either way, it had a bit of saltiness to it. they gave me extra mayo as i requested but not so much it was squirting out all over the place. it was the perfect amount of creamy texture to go with the three slices of bread. crispy lettuce and tomato slices that weren't so thick they popped out of the sandwich. which i can't stand. all the elements balanced each other nicely. everytime i get something here, i'm actually pleasantly surprised by the food. they make all their chips fresh to order! (i eat nachos...a lot) so great to have hot, fresh chips that are so light and crispy and better than so many other mexican restaurants i've been to! if you read my blog on the art of the sandwich...this is what i'm talking about...it can be something so basic, but when its put together well, its enjoyable. they care...and i thank them for that. this is also why i always tip them...why wouldn't i? i do at any other restaurant...and these guys work hard. kudos to the chefs in the kitchen for providing me with the energy i need to bowl three games every wednesday night.